Nov 2002. Dennis Bradley sent in this class photograph. see also his 1951 photograph. As far as I can tell, it is Primary 1 class of 1948, and if my rapidly fading memory is still working, the teacher was Miss MacMillan. I don't remember all of the names, hopefully your audience can fill a few. Ones I can remember I have listed. Other trivia I can remember is that it was winter, and it was pouring down. Hence the predominance of wellies, and the fact the picture was taken in the assembly hall. I can still remember the duck-egg blue paint on the upper walls, and the large gong that the janny used to operate." Please contact the Webmaister if you can put a name to a face or hiv ah tale tae tell. my childhood. I think I have discovered myself in one of the school photos but I am not sure. It was Queen Mary Street Primary 1948 Class of 5 year olds. I am in the second row, eight from the left (I think). I would like to contact the person who sent it in"
Hello Webmaister, I have just come upon your web site and found my picture in Queen Mary Street School. I have these original school photos. 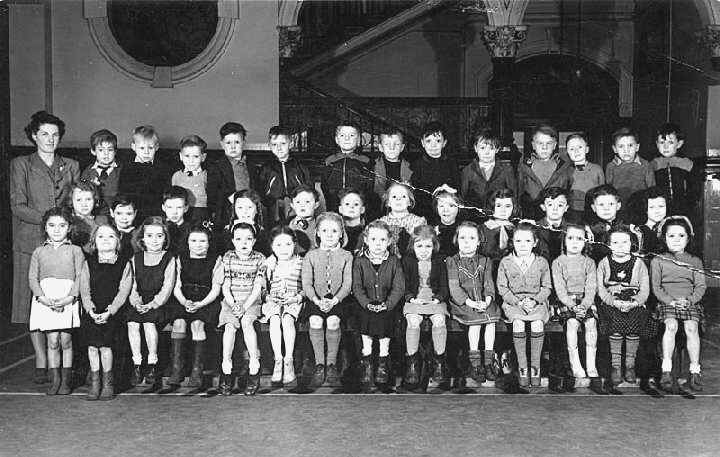 I am number 1 in the front row in the class of 1951 Margaret Millar also in 1948 primary 1 front row number 2 Margaret Millar.I would be interested to contact Christine Eagleton who was my pal in school. I am amazed at this site. Dear Webmaister could you please add my mum, Joan Murdoch in Queen Mary street school, class pic of 1948, front road 11th from the left.